As predicted, we had two dry hours in the morning and then rain for the remainder of the day. Jan baked two loaves of brown bread with a cheese topping and I set up the new generator and recharged the domestic battery bank. Jan asked for the Refleks stove to be lit this morning as she was feeling cold. It’s been running all day on the lowest setting and Waiouru is very cosy. Actually if it gets much warmer I’ll need to find my summer shorts! We’ve made three purchases. 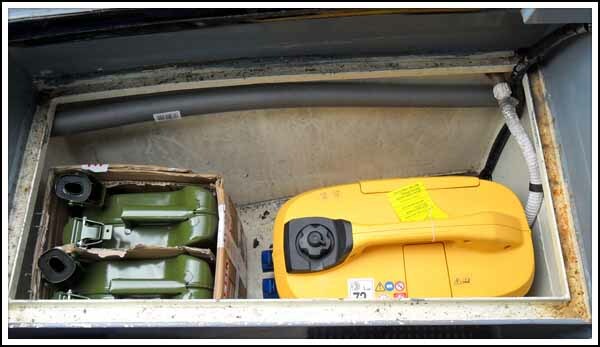 A Kipor 2000 watt suitcase generator, two 10 litre steel jerrycans and a CTek battery charger. The plan is to ensure the domestic bank is fully charged once every week and also ‘equalize’ every six months. The Kipor is rated at 7 amps (240V) and recharged the batteries this morning in three hours. A decision had to be made whether to purchase a Kipor 1000 or the larger 2000. In the end I opted for the latter because both of them have the dimensions to fit in the locker and the 2000 will allow us to both re-charge the batteries through the Victron and simultaneously draw on the 240V supply. The 1000 could only provide enough power for recharging the batteries. The Kipor is secured to the boat with a locked bicycle security cable. When it’s running on the bank I secure it to the end of the aluminium folding gangplank with the same cable and padlock. It’s a long term investment because it’s unlikely we will sell the Kipor when we eventually sell Waiouru. With a maximum output of 5 amps DC there is little point in attempting to use the CTek charger to recharge the domestic battery bank. 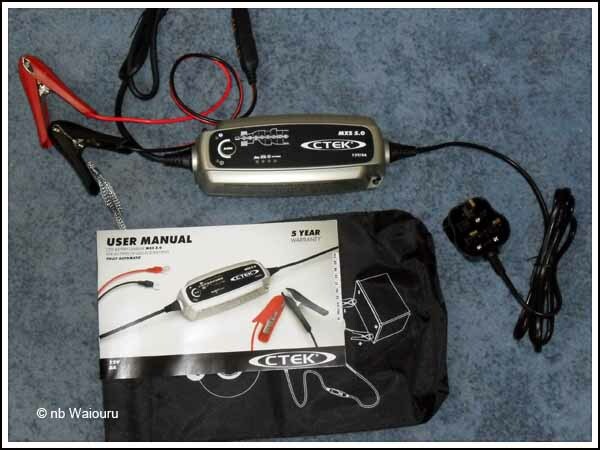 However it’s the cheapest model CTek I can find with the pulse and battery reconditioning stages. We need between 15.8 – 16.04V to do a reconditioning of the Rolls batteries and the CTek produces 15.8V . It’s a very nice car battery charger and will almost certainly go back ‘downunder’ when we eventually leave the UK. Actually it will be nearly new having only been used once every 6 months! Of course I vigorously searched the internet to find the lowest price for our purchases. The local K&A water level continues to rise and I also note the same is happening on the Thames. Stuck Again! Woolhampton swing bridge must have been repaired as we have seen a small group of ‘half drowned’ hire boaters come from that direction. Apparently the hire base has four boats stuck on the wrong side of County Lock in Reading (closed due to high water levels) which must create some grief with their bookings! I have used the same model of generator for 3 years for charging batteries at a communications site. Over this time I have found it to be a generally reliable machine. There are a few things I have experienced during this time that can cause problems. The fuel cap can draw in damp when run in wet conditions and result in water in the tank. To prevent this I now fit a modified square 10 litre (could be smaller) water bottle over the tank cap overhanging the end of the generator.This keeps the moisture out with no further problems. The other warning is to use the generator in intelligent mode only when there is a load that is static in current draw as if used in this mode with high current intermittent loads can destroy the inverter. When starting I have found that there is no need to rapidly pull the cord but gently pull out, when engaged, 6-7 times works without the arm strain. There are a lot of my boater bloggers on the K&A at the moment, so I am just leaving a comment on each of your blogs to warn you of a bandit ahead. Please take care of your stuff, watchout what you leave on the roof and make sure you lock everything up carefully. Thanks for those useful tips! I'm on a steep learning curve!